Oxford Instruments is delighted to announce Dr Michihisa Yamamoto from the Quantum-Phase Electronic Center, The University of Tokyo, and Center of Emergent Matters, RIKEN, Japan as the winner of the 2017 Sir Martin Wood Prize. Dr Yamamoto was awarded the prize for his work on the “Control and detection of quantum phase in semiconductor nanostructures”. It involved successfully detecting and controlling quantum interference effects of travelling electron waves in state-of-the-art nano-structures, opening a path to “Quantum Electron Wave Technology”. 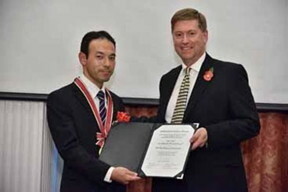 Professor Yamamoto was awarded with the medal, certificate and a cash prize of ¥500,000 at the British Embassy in Tokyo by Mr. Paul Madden, the British Ambassador on Friday 10th November 2017 and gave a lecture on his work at the 2017 Millennium Science Forum organised by Oxford Instruments and chaired by Professor Maki Kawai, Director General of the Institute for Molecular Science. The guest speakers at the event were Professor Eleanor Campbell from Edinburgh and Mr. Griff Jones, Head of Science, Innovation and Global Challenges, British Embassy in Tokyo. The Millennium Science Forum was established in 1998 to promote scientific exchange between Britain and Japan and award the Sir Martin Wood Prize to a young researcher from a Japanese University or research institute, who has performed outstanding research in the area of condensed matter science. The prize is named after Sir Martin Wood, Founder and Honorary President of Oxford Instruments plc.